Yesterday, there was this post discussing Nick Saban and some more of his comments about his defenses vs. hurry up, no huddle offenses. In a nutshell, Saban believes his defenses played better than the scoreboard and stats sheets may indicate, but there’s also loads of room for improvement. I know this will mean a lot to Nick Saban, but I concur with him. And I believe the Tide defense will play a lot better this year. Statistically speaking, at least in terms of order of finish, it will be hard for the Tide D to improve. Last season, the unit ranked first in the conference in total defense and scoring defense. Even in the age of so much offense, those are impressive feats. Stats are for losers, I know, but those stats do tend to prove part of Saban’s argument as well. For all of the sky-is-falling talk, the defense, at least on paper, was impressive. But we are left with the impression that is wasn’t. Why is that? I think, in part, it’s because of the blood-letting at Texas A&M, the loss at Auburn and the implosion against Oklahoma. Again, this matches up against what Saban said. So what what will be different this year? Why do I think the D will be better? And how can it be better than finishing first statistically? * Johnny Manziel plays for the Cleveland Browns now. For me, this is a good thing and it’s not because I like the Browns. Johnny Football was an amazing talent, the kind that hopefully only comes along once in a while since he plays for a conference rival. Yes, Alabama won last year and barely lost in 2012, but the kid could play. Like his Heisman brother Tim Tebow, he was the kind of college player that could ring up huge numbers, make plays and cause trouble. I’m glad he’s gone. The Aggies will replace him with another talented player, but the odds that the replacement can play like Manziel are rather slim. * Alabama should have better defensive line play. A’Shawn Robinson and his gang on the D-line can play and will provide a talent upgrade over last year’s unit which could hardly generate a pass rush. * Alabama will have better defensive backs. Though it wasn’t unexpected for him to leave, the loss of Dee Milliner hurt. Deion Belue had talent, but it was nowhere near the level of Milliner’s. That meant we had no shut down corner last year and that hurt. Nick Saban’s defenses aren’t at their best with no shut down corner. 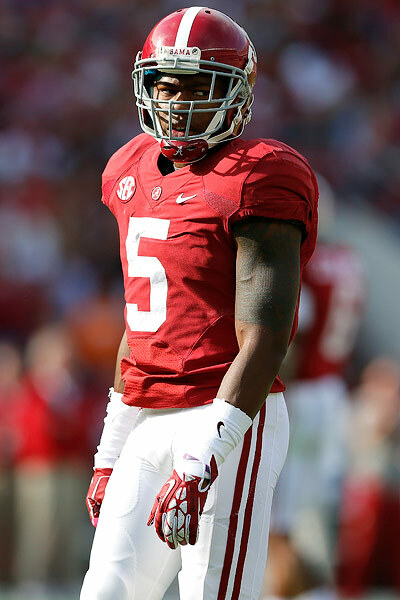 Eddie Jackson, Maurice Smith, Cyrus Jones and Bradley Sylve are very talented players, but most of them were too overwhelmed to play freely and contribute meaningfully. That should change this year with another year of experience under their collective belts. Oh yeah, newcomers Tony Brown and Marlon Humphrey can play, and they will, even as freshmen. * The leadership dynamic will be different. Sometimes a leadership change brings better results, even if the previous leaders were good players and good leaders. I think that will be the case this year. * The HUNH offense isn’t new anymore. Defenses have had to adjust to the pace hurry up offenses for a couple of seasons now. That part of the fad is over. Hopefully, now will be more used to the pace and can improve upon making defensive calls and adjustments on the fly. This entry was posted in Alabama Crimson Tide and tagged Alabama Football, College Football, HUNH, Nick Saban by Bryant Denny. Bookmark the permalink.